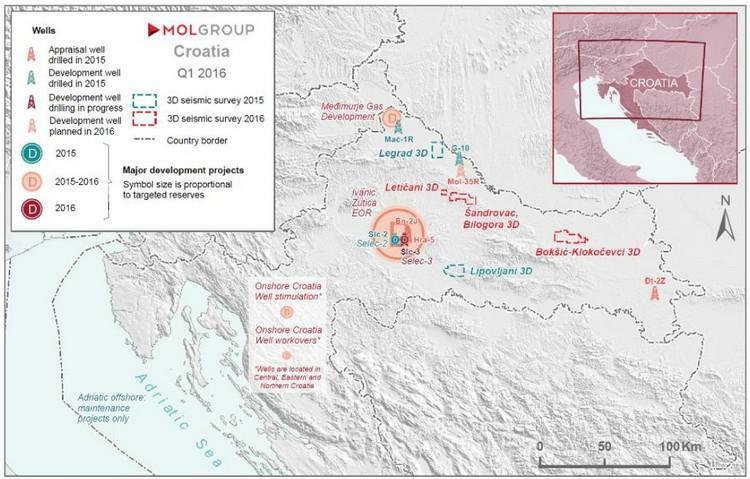 MOL has announced that INA has successfully started its test production in two of its gas fields in Croatia, following a USD 64mn (HRK 450 mn) investment program in the Medimurje project. INA has begun the test production of gas at two of its fields, Vuckovec and Zebanec, as part of its Medimurje project. At the third field, Vukanovec, production is expected to begin in early 2017. Incremental production is estimated at around 2.0 mboepd in H2 2016 on average and it is expected to further increase in 2017. INA has invested USD 64mn (HRK 450 million) in the project. Five production wells were drilled and equipped along with a total of 100 kilometers of new pipeline. Cumulative yield of gas is estimated to be at around 1 billion cubic meters and the vast majority is to be exploited by 2024. An additional main objective is that the carbon dioxide that is being extracted from the fields in the Medimurje project will be transported to the Žutica and Ivanic oil basins via pipeline. It will then be re-injected into the ground in the frame of INA’s ongoing EOR project.